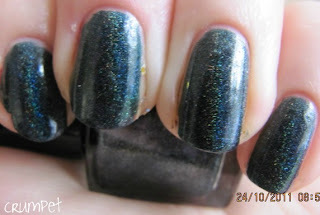 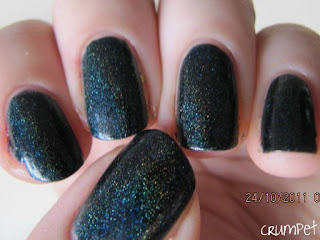 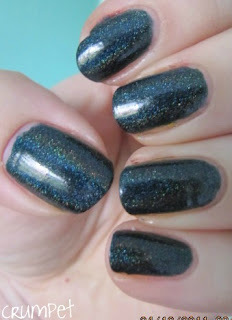 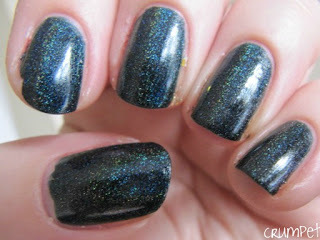 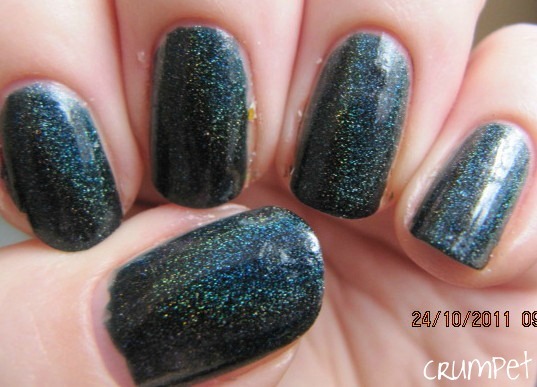 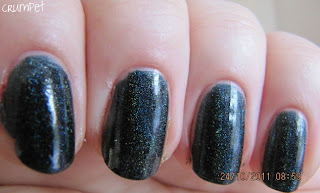 Another gem from LLAROWE, this is Lizard Belly, a holo dark green. 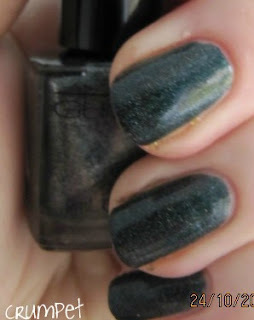 Lizard Belly is a super intense green. First, this is an extraordinary green. 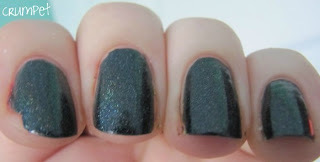 It’s super dark, and there is no warmth in it whatsoever. It’s like a sea of forest pines, shivering in winter – this has a very cold edge. 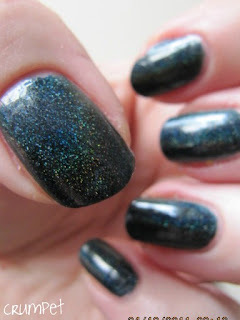 The holo in it also leans blue, again emphasising the cold heart of the colour. 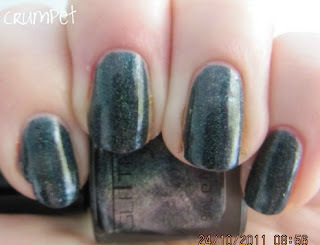 There are echoes of teal and petrol in there too, but this is pure, dark, evil green. I really love the holo in this one. 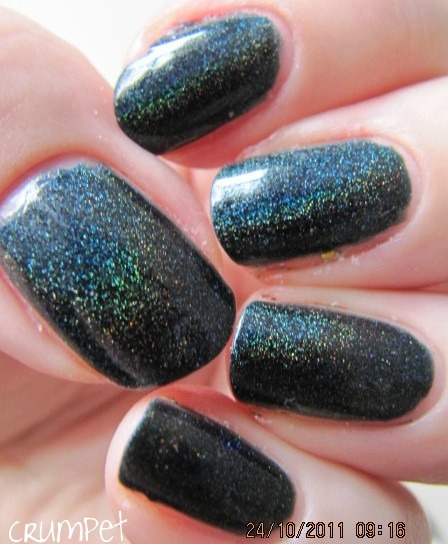 Totally linear, it perfectly compliments the base colour and stays in the yellow-green-blue spectrum, giving it a narrower range, bur making it more effective at the same time. In my mind, I’m scrolling through other dark greens I’ve owned, and nothing comes close to this, not even OPI’s Here Today, Aragon Tomorrow. 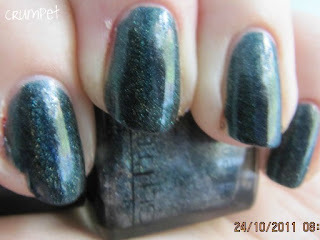 It’s a very precise balancing act that has been achieved here – green sooooo dark, yet still sooooo green. This never leans to black or blackishness, just cold watermelon rind green. 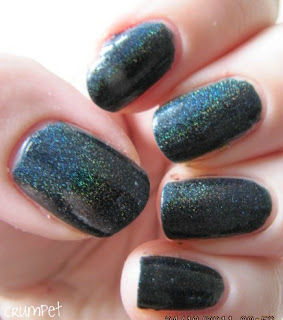 In the bottle, this does look slightly different – it has a charcoal colour with flashes of light (like an intense thundercloud) but on the nail, it’s all about the green. 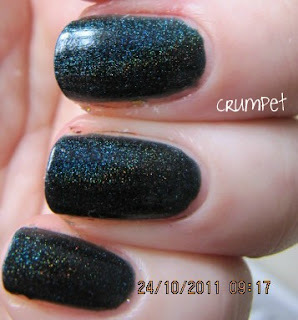 This is one of those rare indefinable polishes that is worth owning just for the attention you get from it, but there is nothing that can detract from the petrol blue-green heart of this heartless, hollow holo.